A. Customer Number. This is the first 7 digits of the Account Number located on the upper left corner of your statement/invoice (see sample below). B. Account Number. This is the last 10 digits of the Account Number located on the upper right corner of your statement/invoice. Be sure to include any leading zero’s (see sample below). C. Username. The length must be between 3 and 256 characters (refer to screen for characters). D. Password. CASE SENSITIVE—The length must be between 7 and 256 characters and must contain a numeric and a special character. (Refer to screen for characters). E. Email Address. This will be used to confirm your account, and also have ebills sent to. Be sure that you add utilitybilling@siouxfalls.org to your safe sender/not spam list. F. Billing Zip Code. As it appears on your statement/invoice. Only the five (5) digit U.S. Postal Zip Code is accepted. G. Receive eBills? Select True if you would prefer to have your bills sent to you in Email. Otherwise leave the selection to False to have paper bills mailed to you. 2. Click the Register button when finished. 3. You will receive an email confirmation (check spam/junk inbox) containing your account activation code and an internet link to the login page. 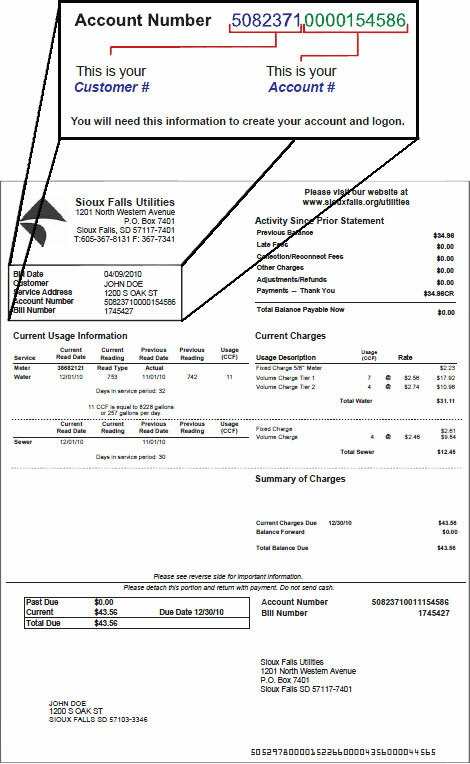 Please add utilitybilling@siouxfalls.org to your safe sender/not spam list to receive your activation code and regular email notifications. 4. Click the internet link provided within the email. 5. Type your Username and Password and the Activation Code if it is not automatically displayed. Enter your Activation Code exactly as it appears click the Submit button. 6. You are now ready to enjoy ONLINE BILL PAY!